Here's weird. I hate the beach. I hate the sun. I hate the sand. It's also weird that I hate all three things given that my peoples are from the Philippine Islands. So, it's weird that I would have so many magnets from Hawaii. No, really! Everyone I know who goes to Hawaii ends up bringing me back a magnet - which of course, I love, (thank you) but it makes me giggle whenever I see them. 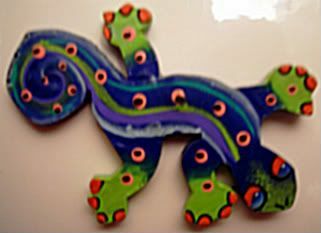 This lizard I had to make sure was from Hawaii, and I got it confirmed when my friend who brought it back for me said she wasn't totally sure that's where it's from, but she thinks of Hawaii every time she sees it, so it must be from Hawaii. Right? But, I digress. It should be known that I place the beach-hatred blame on the weekend getaways to the beach down in North Carolina. Actually, I use the term weekend loosely. Mainly, it would be a random Friday night, where my parents would come home from the office and say, pack up, we're going to the beach. And at 3 or 4 in the morning, we'd be rousted from our beds, piled into the van, and would arrive at the beach about 4 hours or so later. We'd basically spend the morning and afternoon on the beach, and tis true - it was fun. Until the ride home on Saturday night. Where we'd have to change back into our quite sandy civvies, and sit in the van - damp and sand-ridden all the way home. Ugh. Sand in our underwear - not fun. Hah...so I guess we wouldn't be finding you at any of the Filipino Su-Tu-Kils, where you pick out your meal from the piles of fish (and other delicacies) from the day's catch. My non-fish eating sisters were totally grossed out.